This latest tragedy has placed Carnival Cruise Lines back in the spotlight. The loss of Qwentyn Hunter in one of the Carnival Victory’s pools prompts many to question whether conspicuous signage that there are “no lifeguards on duty” is realistically enough to fulfill the cruise line’s duty of care to provide a safe and proper place to bathe or swim. Injured on a cruise ship? You need a cruise ship injury lawyer! When a passenger sustains an injury while on a cruise ship or while on a shore excursion purchased through the cruise line, a maritime law attorney must be contacted immediately so as to maximize the recovery of a potential personal injury claim or lawsuit, and more importantly to not jeopardize the investigation and fact-gathering process that must be done as early as possible and is absolutely critical in litigating against a cruise line. Most passengers feel safe at sea and are confident that, whichever activity they chose to purchase, the cruise line has done its homework and would not risk the safety and livelihood of its passengers. That misconception has led to countless incidents. Worse, it has led passengers to trusting the cruise line in rectifying their mistakes, or acts of negligence. Most, if not all, cruise lines have important procedural conditions that all passengers must know prior to embarking on a cruise. One of these procedural conditions is the time frame within which an injured person must act in order to file a claim against the cruise line. Cruise lines have uniformly imposed a one-year statute of limitations on any and all personal injury claims against them. If a lawsuit is not filed within one year of the incident which caused a person’s injury, that passenger’s claim will be barred forever. Not only that, Cruise Lines have also uniformly and arbitrarily imposed a six-month notification deadline. The clock on your potential personal injury claim starts ticking the day the incident happens, and if you wait too long, your case, which could have been worthy of representation months prior, could be turned down simply because it is too late to act. You must protect yourself and do your due diligence by contacting a reputable maritime law attorney as soon as possible after you return home from the cruise. Many passengers will elect to resolve their injury claim on their own. They will contact the claims management department several weeks after the incident and attempt to obtain a recovery without any professional help. That is the second biggest mistake you can make. First, the person assigned to your case will ask to obtain a statement from you about the incident. They will only ask questions that may put the blame on the injured person and not ask or inquire about any facts that may or may not show the cruise line’s negligence. Second, they will stall the claim’s process. By now, the incident occurred several weeks, if not a couple of months ago. They will ask that you provide a copy of all of your medical records, and medical bills, so the claims department can “evaluate” your damages. Some passengers are quick to obtain medical records, but most are not knowledgeable enough and several months will go by before the claims person will be in possession of your medical records and bills. The next step is full denial. At that point, the cruise line has all of your records, it has an idea of the damages you have sustained in the incident, and it also knows how the incident happened. They will invariably tell you that the statement you have given to the ship’s doctor or the ship’s security staff is inconsistent with the statement you gave over the phone. Or they will tell you that the damages you are seeking are unrelated to the injury you claim you sustained in the incident. Or they will dispute the charges you claim you have incurred, or stress the fact that your health insurance paid for your bills and therefore your medical bills are irrelevant. Or they will insist on telling you that they need more time to make sure their investigation is concluded before they can either deny the claim, or make your an offer. Tagged: "Alexander Perkins", "Carnival Cruise Lines", "Carol Finklehoffe", "Celebrity Cruises", "Ira Leesfield", "Leesfield & Partners", "Princess Cruise", "Robert Peltz", "Royal Caribbean Cruises", "Statute of Limitation" and "Thomas Scolaro"
Article written by Robert D. Peltz and Carol L. Finklehoffe of Leesfield Scolaro, P.A. Published in the Massachusetts Academy of Trial Attorneys Journal. Over the past decade, the number of passengers cruising with North America’s largest cruise lines has literally exploded. According to industry figures, the number of passengers has dramatically increased from 9.5 million in 2003 to over 16 million passengers forecasted to cruise in 2012. As the industry itself is quick to admit, at least to its shareholders and tour excursion partners, the continued development of new and existing excursions has played a major role in this growth. Nevertheless, at the first sign of an excursion gone awry, the cruise lines have been quick to try and disassociate themselves from responsibility for their own creations. In an effort to insulate themselves from liability, the cruise lines have utilized a system of disclaimers, which attempt to hide the true character of their relationships with their tour operating partners. These disclaimers are typically buried in the fine print in the passenger’s ticket of passage and in self-serving statements inserted into the cruise lines’ contract’s with their tour operators. There is typically a wide divergence, however, between these self-serving statements and the facts on the ground when it comes to describing the cruise lines actual relationship with its excursion partners. Overcoming these inaccurate self-serving and inaccurate descriptions contained in the carrier’s written and electronic materials therefore typically becomes the first order of business. Contrary to these disclaimers, the most accurate description of the relationship between the carrier and its tour operating partners is best characterized by the joint venture. Nevertheless, because of the degree of control maintained by the carrier, various other agency relationships are equally as applicable in most cases. This article will discuss the nature of these various relationships, strategies for holding both the carrier and tour operator responsible for their conduct and the discovery which will be helpful in the process. Although most of the attention in excursion cases is typically focused on holding the cruise line responsible for its negligence, it is important not to overlook the case against the tour operator. Sometimes, one gets lucky and the tour operator is located in the U.S. Virgin Islands, Puerto Rico or some other domestic location. Most of the time, however, that is not the case. Nevertheless, that is not reason for despair. 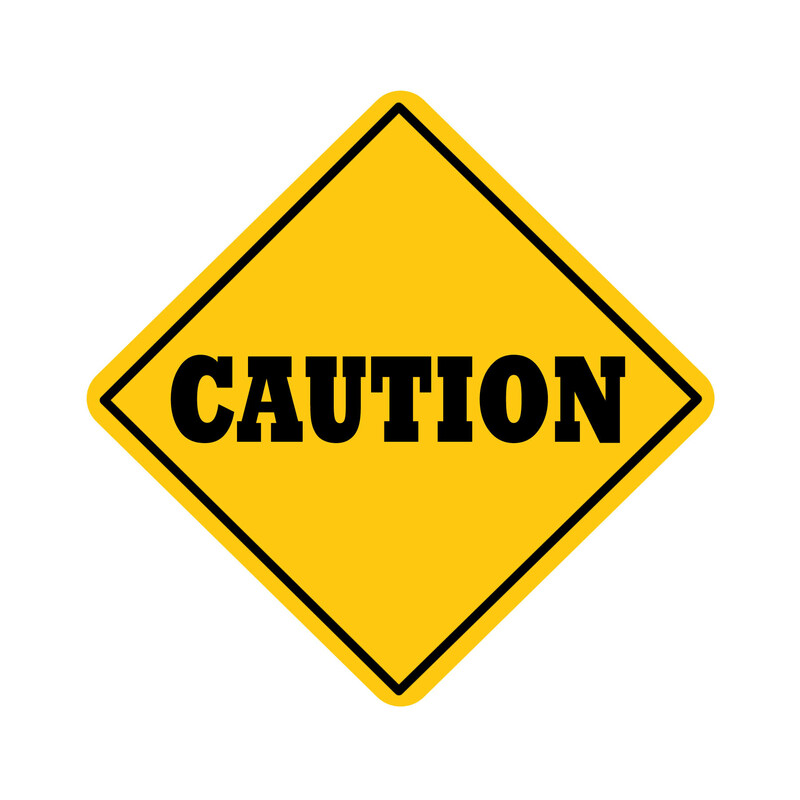 Tagged: "Carol Finklehoffe", "Cruise Excursions", "Cruise Ship Excursions", "Ira Leesfield", "Leesfield & Partners", "Robert Peltz", "Shore Excursion Accident" and "Shore Excursions"
Media storm necessary in shedding light on glaring shortcomings of Cruise safety? In the last 3 years, the cruise line industry has been dealt blows that would have knocked out any other business. Starting in 2010 with the fire aboard the Carnival Splendor, followed over a year ago with the deadly incident of the Costa Concordia. This month, another fire broke out aboard the Carnival Triumph, causing over 3,000 people to be stranded at sea for several days, forced to live in unsanitary conditions reminiscent of a third-world country slum. Yet, Carnival Cruise Lines, and the rest of the cruise industry continues to strive and attract more passengers than ever. Translation: the cruise industry is bringing record revenues and earnings despite tragedies blames on cruise employees (Concordia) and business decisions made by some of the richest executives who working in the leisure business. Tagged: "Carnival Cruise Lines", "Carnival Splendor", "Carnival Triumph" and "Leesfield & Partners"
Can I sue Carnival Cruise Lines for the Carnival Triumph fire? In 2010, a fire broke out in the engine room of the Carnival Splendor, disabling the large cruise ship, leaving thousands of passengers and crew-members stranded at sea for days. In early 2012, the Costa Concordia ran aground after its captain committed the unthinkable, which caused the death of 32 people. Despite these avoidable tragedies, and the public relations storm it found itself in at the time, Carnival Cruise Lines is reporting steady revenues and earnings. For 2010, Carnival reported revenues of $14.4 billions. In 2011 and 2012, revenues increased to $15.7B and $15.3B respectively. While posting very strong revenues, the company’s earnings are just as strong, posting earnings of $2.42B in 2011, followed by $1.88B in 2012. Tragedies and public relations disasters affect Carnival, and the entire cruise industry, relatively mildly compared to other businesses. Empirical data shows that the public at large, and cruise line customers have a very short collective memory when it comes to vacationing on a luxurious cruise ship. Since 2006, North American cruise passengers have steadily increased from 9.13 to 9.72 million in 2011. Worldwide in 2010, it is estimated that cruise ships were visited by 14.3 million passengers. The question begging to be answered is, even if the public’s collective memory fades so rapidly that it does not affect traffic and consumption, why aren’t cruise lines taking a financial hit for their serious miscues? Answer is simple: Cruise lines do not respond to anyone or anything. Carnival also disclaims that the ship is not responsible for, and entitled to do anything its Captain decides in the event of a “breakdown of the vessel”. The ticket also contains a “Class Action Waiver” which provides that passengers waive the right to form a class action to seek recovery. In cases where the passengers only claim is a ruined vacation, class actions may be the only form of effective remedy. The legal validity of the clauses is still an open question. 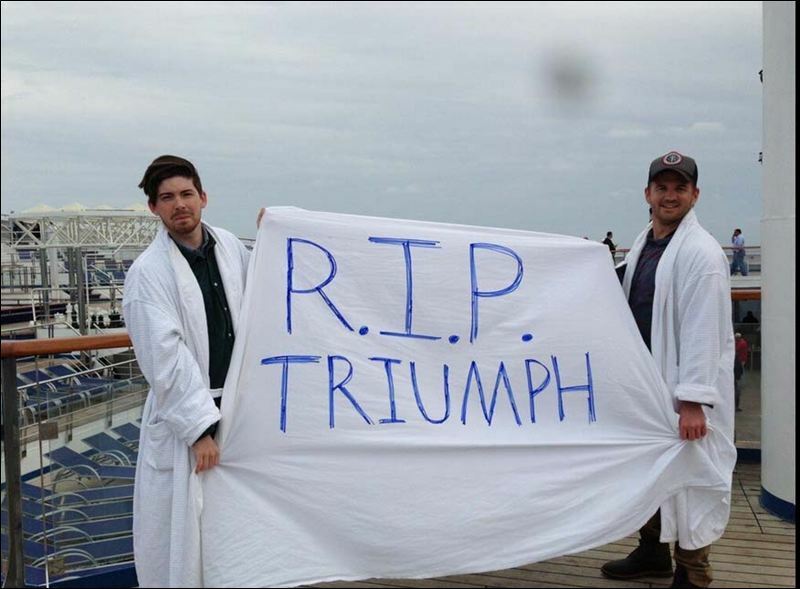 Under what circumstances could a Carnival Triumph passenger sue Carnival? Carnival can be sued if its ship committed an act of negligence that resulted in a passenger’s physical injury. For instance, if a passenger slips on urine in the middle of a hallway, and ends up fracturing a hip, Carnival can be held responsible. A passenger, who becomes physically ill from the poor conditions or contracts an illness, will also likely have a valid claim against Carnival. But the hundreds of passengers, who were “merely” subjected to sleeping on the floor with hundreds of other people in hallways flooded with urine smells and worse, will have a much more difficult time asserting claims. Although claims for so-called negligent infliction of emotional distress are allowed in certain circumstances, they are generally limited to situations where the passenger was within the “zone of danger” of physical harm and suffered an emotional injury with some physical manifestation or psychological diagnosis. Recently, Leesfield Scolaro very successfully resolved a cruise passenger claim after our client fell due to conditions caused by a fire on board a different ship that had left the vessel stranded in the middle of the ocean, thereby creating an unstable platform for walking. Tagged: "Carnival Corporation", "Carnival Cruise Lines", "Carnival Splendor", "Carnival Triumph", "Carol Finklehoffe", "Cruise Ship Fire", "Leesfield & Partners" and "Robert Peltz"
This week in Rome, court-appointed experts have presented their 270-page analysis on what truly happened on the evening of January 13, 2012, which saw the cruise liner Costa Concordia hit rocks off the Tuscan island of Giglio and finished its course beached on its size. As a result of a series of the captain’s reckless decisions and Costa Cruise Lines’ incompetent employees, 32 people died that night. 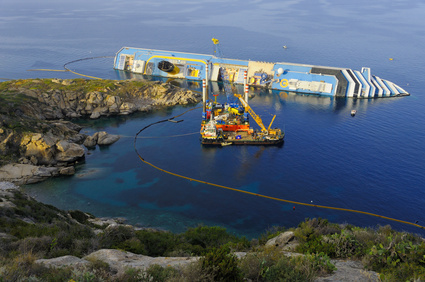 You can read Cruise Ship Lawyers Blog’s entire account and article on the incident of Costa Concordia here. The court overseeing the criminal investigation in Rome, Italy, had named and ordered several experts to review the audio and navigational data extracted from the ship’s black box. On Thursday, experts turned in their extensive report to the court, which was leaked the same day in the Italian press. Tagged: "Captain Schettino", "Costa Concordia", "Costa Cruise Lines", "Francesco Schettino", "Ira Leesfield", "Leesfield & Partners" and "Robert Peltz"